When should you get carbon monoxide (CO) detectors for your home? Does every home need one? What kind of appliances can cause carbon monoxide poisoning? The short answer to all of these questions is: When you are burning any type of liquid or solid fuel for heating, cooking, or other uses, you should have CO detectors installed in your home. And because cars and other gas-powered equipment create carbon monoxide, virtually every home should have a CO detector, even if there are no fuel-burning appliances in the house. Carbon monoxide is a gas that is present in the air, but it's the presence of high levels—such as those emitted by burning fuel—that can make this gas deadly. Carbon monoxide is a pollutant formed by the combustion of hydrocarbon fuels, including natural gas, propane, wood, coal, and gasoline, among others. All combustion appliances and equipment around the home produce CO gas, no matter how energy-efficient they are. This poisonous gas is odorless, colorless, and tasteless, which is what makes it so dangerous. The health concerns occur because when CO enters you lungs, it binds to the hemoglobin of red blood cells, taking the place of oxygen.This leads to oxygen starvation (hypoxia) of the blood cells. 0.5–5 ppm: Normal level of CO for homes with combustion appliances. Below 70 ppm: Exposure for 6 to 8 hours can lead to symptoms including headaches and dizziness. People with heart conditions may feel additional symptoms, such as chest pain. 100 ppm: Exposure for two hours or more can cause a headache, fatigue, and nausea. 150–200 ppm: Long-term exposure can lead to death. Recommendations for CO detectors are similar to those for smoke alarms. As a minimum, each home should have one CO detector on each floor, one in or just outside each sleeping area, and one in the basement. In homes where multiple bedrooms adjoin a common hallway, a single detector in the hallway can provide protection for all of the rooms. However, if the home has forced-air heat (with a conventional gas or propane furnace), carbon monoxide leaking in the furnace system can reach each room individually. Therefore, it's safest to include a separate CO detector in each bedroom or other sleeping areas. If other areas of the home, such as an attic or closed-in porch or sunroom, have combustion appliances or are used as sleeping areas, each of those spaces should have a CO detector. The same is true for a garage or outbuilding (greenhouse, garden shed, etc.) with a non-electric heater. CO detectors are available in plug-in and hard-wired models. 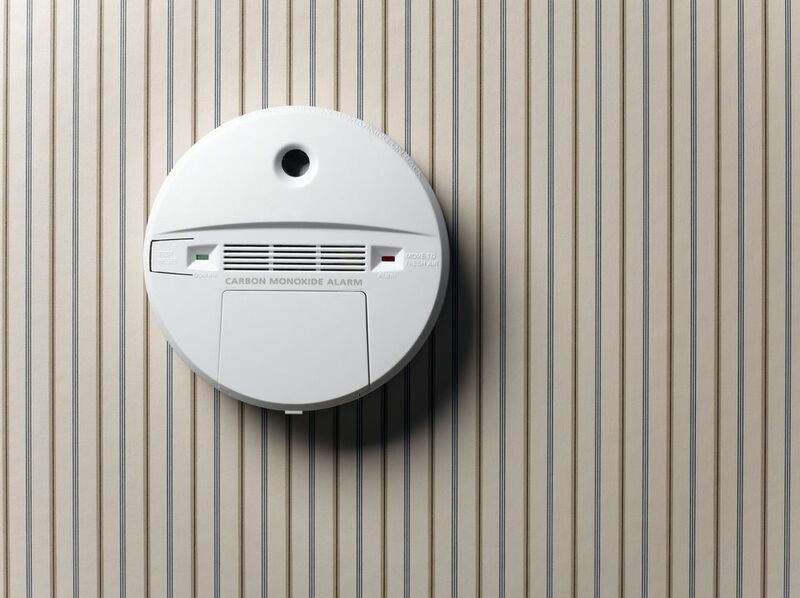 There are also combination detectors that provide detection for both fire and carbon monoxide. Hard-wired detectors are connected to a home's wiring system and should include batteries for backup power so they keep working if the power goes out. Plug-in detectors simply plug into any standard electrical outlet and always include battery backup. Most hard-wired detectors are interconnected so that if one detector is triggered all of the other detectors in the house are automatically triggered and sound their alarms. Interconnection capability is available on some plug-in detectors, which interconnect through wireless technology. While standard CO detectors have basic digital readouts or lights indicating various alarm functions or low-battery conditions, CO detectors with a digital carbon monoxide display include a readout of carbon monoxide levels (in ppm) at all times. This can help with early detection of problems with combustion appliances (such as a leaky furnace or poorly vented hot water heater) and can alert you to higher-than-normal CO levels, particularly levels that lead to symptoms but are not high enough to trigger an alarm. Anyone can install plug-in CO detectors; you simply put in a fresh battery and plug the unit into any outlet that is not covered by furniture, drapes, or other obstructions. Homeowners with electrical experience can easily install hard-wired detectors; otherwise, an electrician is the best pro for the job. Closer than 5 feet from cooking appliances or within 20 feet of combustion appliances. Maintain your CO detectors by cleaning them monthly with a vacuum and soft brush attachment. Replace the battery in each unit every six months. Replace the detector units as recommended by the manufacturer; the units don't last forever. To keep track of how old your detectors are, write the purchase date on the back of each unit before installing it. You will see this date every time you change the battery, so you can replace units before they hit their expiration date.